Christmas traditions…oops, Holiday traditions…how terribly politically incorrect of me. I like the idea of including everyone in my salutations of the season, but if you know someone is Christian, why not wish them “Merry Christmas?” or if they’re Wiccan “Happy Solstice?” (etc.) It’s the warm wishes that are important, the sincerity behind the words, yes??? Teeth whitening aftermath. Can’t have staining things (coffee, tea, berries, red wine, pasta sauce, brown gravy) for two days until your teeth re-hydrate. Yup. The whitening process dehydrates your teeth and they’re like dry sponges that will soak up anything until they’re hydrated again. Never thought of teeth as needing water. Who knew? And how do teeth feel while they’re dehydrated? And what price is beauty? I was given a prescription for pain medicine, but I found Advil worked just fine. Weird the lengths people go to for appearance enhancements. 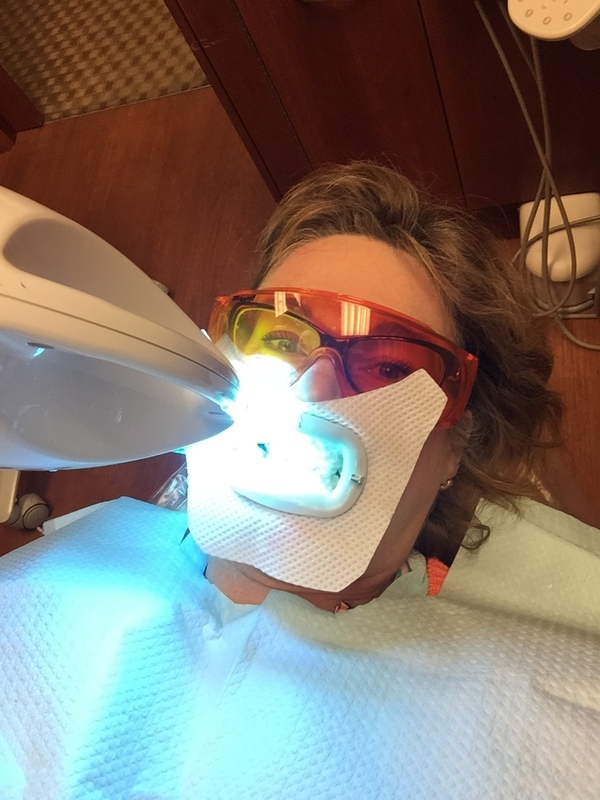 Show of hands, peeps….who has had their teeth whitened? (pause, looking at the raised hands) And how was that for you? Was it worth it? Jury’s still out with me. Wasn’t that the oddest thing you’ve ever experienced? Or close to it? I settled into the dental chair and am handed about 5 pages of non-liability forms to sign. Really? When signed, the technician put a mouth-guard-type apparatus into my mouth, exposing my choppers, so my lips could be out of the way for the duration of the process. Then, she handed me a set of goggles for my eyes, and put a little serviette about my lips that made me want to sneeze. Dental tools raised, she hovered over me, and realized that my lower teeth need some tidying up. As she went to find someone to clean them, she scolded me about the importance of good dental hygiene between appointments. Sorry, I wanted to say, I was late so I grabbed a breakfast bar to eat on my way to the appointment. I tried to rinse my mouth out well. Really I did. Alas, I couldn’t defend myself with the apparatus keeping my lips opened. Couldn’t talk at all. Unfair advantage, Tooth Whitening Technician. I do brush and floss…twice a day. Pinky swear. I should have been late and come in with brushed teeth. I’ll never make that mistake again, Tooth Whitening Nazi Technician. Geez. The cleaning technician came, cleaned and went. The whitening technician came back and, appeased, started wedging cotton around my gums. I felt like Marlon Brando, preparing for the Godfather role. Are my teeth whiter than before? Yes. Will I do it again? Hope not. If I use Crest White Strips on a monthly basis. But never shows you this? Have a bright, shiny week, Peeps!!!! Sounds like that was truly nasty! And *then* no coffee or pasta sauce. I agree. Crest strips.